I’ll admit that I groaned when I got the call school would be cancelled the following day. Thoughts of lost work productivity and more hours with kids not long after the extended holiday break crowded my mind. But my groans and worries were interrupted by Elisha’s laughter before nine the next morning. He’s eleven and lives across the street. The adventure of climbing our steep driveway in the snow and ice had him bursting into laughter as he joined my kids, lounging on the couch, watching TV and relishing in the laziness of the snow day. Not long after, his twin sister Elizabeth was also knocking on the door. Within the hour my living room was full of neighborhood kids playing video games and baking cookies. Meanwhile, my husband Jeff had been out gathering the Carver Market and Community Grounds staff from their homes around the neighborhood. When the crew arrived at the stores, neighbors were waiting for the doors to open. The stores filled in a matter of minutes with neighbors needing groceries, caffeine, and reliable wifi. Jeff spent the rest of the morning delivering groceries to neighbors who couldn’t walk their purchases home on the icy streets. Throughout the day, other neighbors dropped by our house. 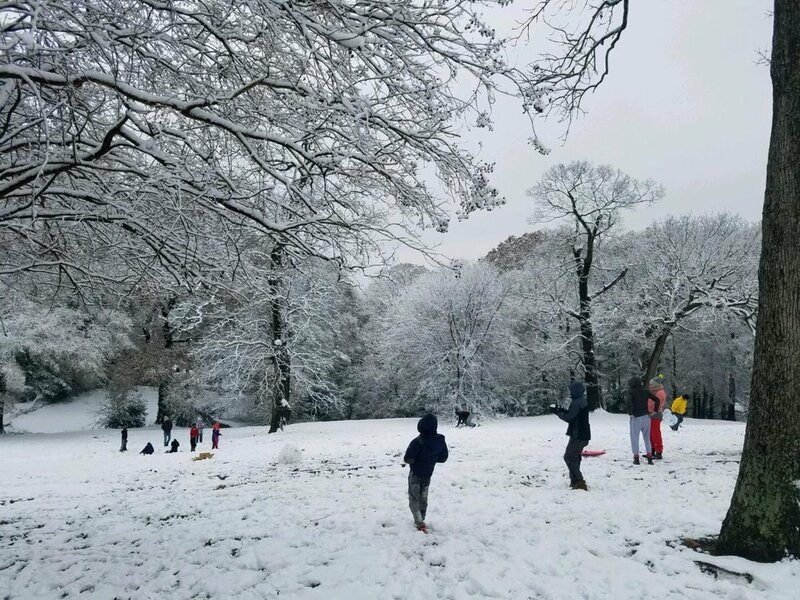 Some had sleds in tow, grabbing the kids to enjoy the hills of our park. And some already had cabin fever and just wanted to chat for a while. I put some ribs in the crock pot and sent a text to neighbors to plan on joining us for dinner. Sometimes when I’m speaking about our work at FCS and my family’s decision to live in South Atlanta, I will get a comment about what a sacrifice it must be to live in a “bad” neighborhood. While I’m sure the comments are well-intentioned, they couldn’t be further from my own experience of living in our community. Snow days cause me to slow down and be reminded of the network of neighbors who work together, play together, face challenges together, and drink coffee together. It’s a neighborhood I’m glad to live in. I’m thankful for the ways weather and geography push us together to forge new connections and deepen ongoing ones. Now, when school was called off again that night, I still wasn’t ecstatic. But I was profoundly aware that there is something wonderful about a snow day. It’s an opportunity to connect with neighbors, which is truly the heart of our work and our life here in South Atlanta.